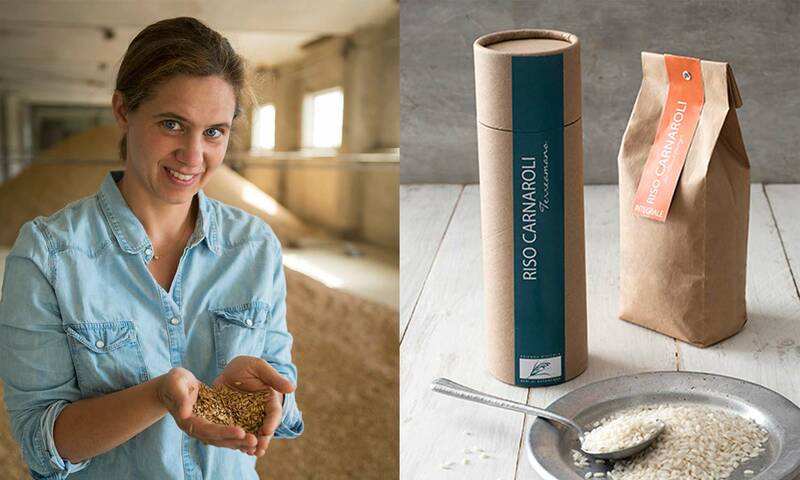 In 2009 Igiea Adami, a woman with a degree in modern history and a Master in economics and agricultural policy, decided to bring rice back to the farmhouse that has belonged to her family since 1867. Today, Busonengo is an enchanting village. And after the rice paddies were organically restored without the use of herbicides, the frogs returned to sing their songs. Igiea Adami is a humanist. She is one of those eclectic figures of the Renaissance with a mind that is capable of embracing a wide range of subjects from the literary (she graduated in modern history) to the technical (and earned a Master in economics and agricultural policy). And she has the ability to give voice to a Catonian vocation: she published a novel with a prestigious academic publishing house about the Baraggia, an area of northeastern Piedmont characterized by spontaneous “moors” that grow with wild, woody plants. Igiea comes across as a quiet forty-year-old, but when you get to know her, you see right away she has strong ideas, an iron will, and a tenacity to sell. Clearly, for her hard work is not a problem. She has bright eyes that shine with life, enthusiasm, passion—everything but cliches, in truth. She has a kindness that doesn’t ever waver even in the hardest of times; when everyone else left the rice paddies, she would not let them go. In fact, she will wait for you while you lose your way innumerable times, and will welcome you in the entryway of the immense farmhouse that her grandmother bought in 1867. The heater is on and the tea is hot. After the death of her grandmother on her mother’s side, the large farmhouse was rented out. But when a place has such a rich past, it can’t deny an equally magnificent future. For years, Igiea patiently waited to return and manage her land and house, which she was able to do in 2009. To avoid just twiddling her thumbs while she waited, she graduated in history and wrote a paper on rice growing in Piedmont in the 18th century. Meanwhile, she married and had two children. She met her husband Guido during her studies to become an agricultural entrepreneur; she fell in love with his integrity and will to produce natural wines without compromises: Barbera, Dolcetto, and Freisa in a vineyard near Monferrato. She adapted his approach to the rice paddies in Busonengo. Is it possible to make delicious rice without using chemical herbicides? 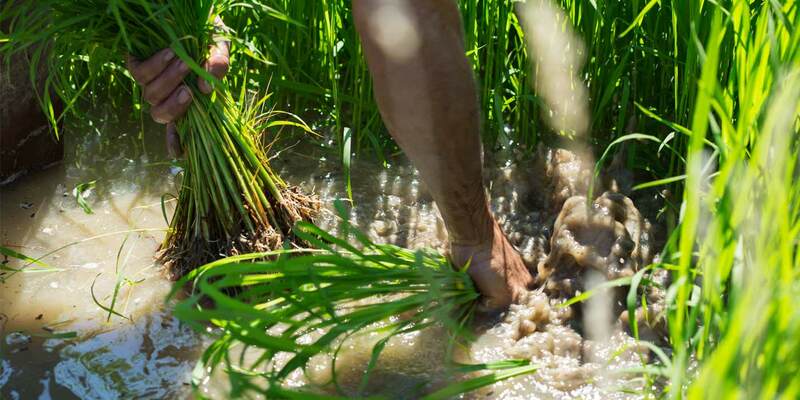 The answer came from a collaborator who remembered a time when rice was cultivated in a greenhouse, and then the small plants were transplated to the already flooded rice paddies—thus avoiding the growth of weeds altogether. Igiea carried out the laborious experiment on a portion of land. The Carnaroli rice planted in this way did, in fact, grow very healthy and eliminated the need for weeding. The climate in this northeastern portion of Piedmont also helps: the ample diurnal temperature variation is hard on certain kinds of pests. 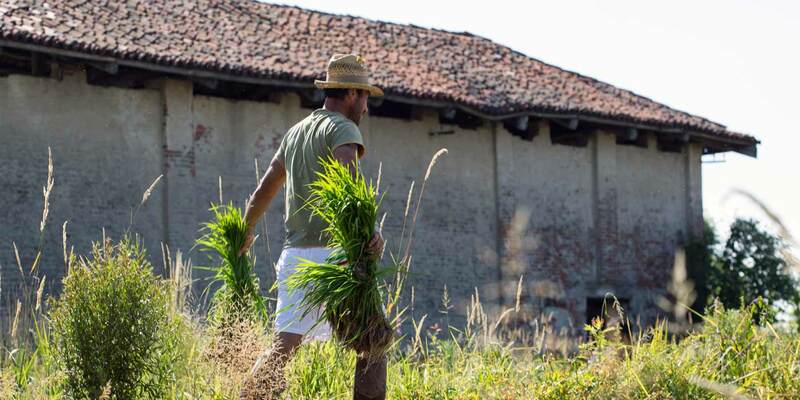 The Carnaroli rice planted by hand was called Terreamano (“hands to earth”), highlighting the hard work and commitment to doing everything manually. As though to celebrate, the frogs returned to sing among the rice paddies; and a recent survey registered the presence of 114 different species of birds. In 2015, a bird-watching walk along the paddies of Busonengo called “Rice paddies in flight” (Risaia in volo) garnered a hugely enthusiastic response and participation from the public. Igiea’s dream is to one day make all of her farmhouse’s rice cultivation manual. Meanwhile, what she has done so far has given her great satisfaction: the rice of Busonengo has particular flavor characteristics that come from the Baraggia’s unique vegetation, the clay-rich soil, and the cold water temperatures—and it has been awarded the DOP certification.